Aloha, my name is Patricia Larsen-Goodin and I have lived in Hawaii since 2006. 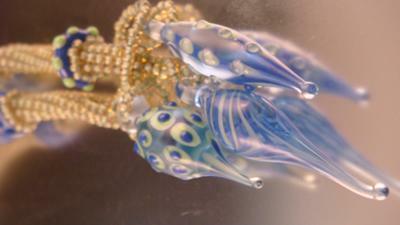 I began making handmade lampwork beads several years ago. I also started designing jewelry primarily using my beads, selling my creations in local galleries. When making jewelry I use handmade beads, manufactured beads, silver and lots of love in each of my designs. My inspiration is drawn mainly from nature and architecture. I was looking for a way to use my handmade lampwork pod style beads, other than just hanging them. I wanted to combine my beads with seed beads to produce an original jewelry piece. 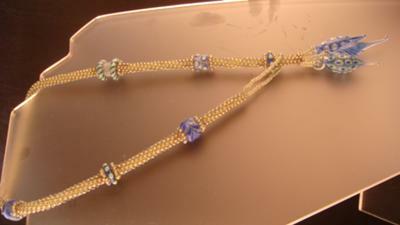 For this design, I made a peyote rope (I am a novice seed beader) and then some large hole beads that fit over the rope. As I was going along I figured out how to attach the beads to the rope, the beads are held in place by a row of seed beads attached to the rope at each end of the bead. 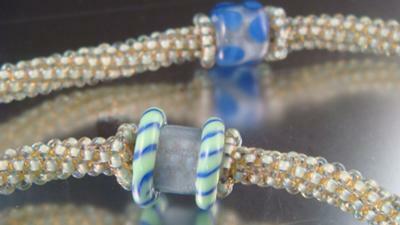 I attached my lampwork "pods" to the rope on seed bead strands which hold them securely in place. I created a seed bead loop on the other end of the rope, this loop slides over the bead "pods" and is a simple but effective way to fasten this handmade jewelry design. I'm very excited about this new foray into seed beading and using my handmade glass beads. 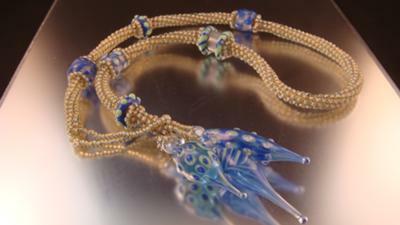 This jewelry creation has been made from size 11 seed beads and my own hand crafted lamp work beads. Join in and write your own page! It's easy to do. How? Simply click here to return to Share Your Hand Made Jewelry.